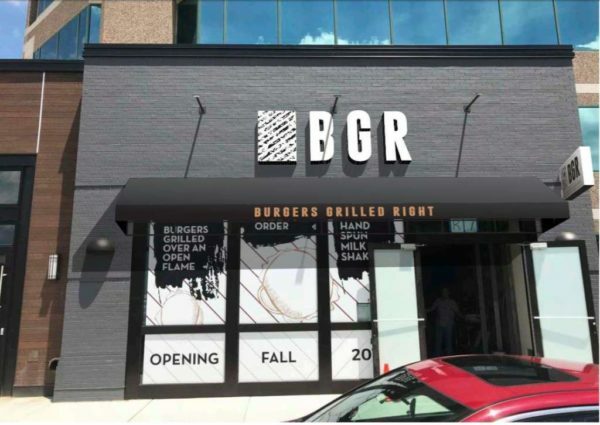 As signs have foretold for several weeks, BGR The Burger Joint will open its newest location in Reston on Monday (Sept. 24), the company announced today. The restaurant, which sells burgers grilled over an open flame and hand-spun milkshakes, is the latest retail tenant to join JBG Smith’s RTC West development at 12120 Sunset Hills Road. The restaurant company did not respond to a request for comment from Reston Now, although an announcement by the company was posted online. BGR has locations in Georgia, Maryland, New Jersey, New York, South Carolina, the District, Tennessee, and Utah. The restaurant is also located in Arlington, Springfield, and Tysons Corner. Two locations are also in Kuwait. It’s currently celebrating its 10th anniversary since it opened the first location in Bethesda, Md. in 2008. Other businesses that are scheduled to open at the development include The Black Squirrel, Forever Nails, and Punjabi by Nature. More retail tenants could be on the way if the county approves an application by JBG Smith for expansion of the existing development, which is mostly office buildings and ground floor retail so far. The Fairfax County Board of Supervisors will vote on the expansion project next week.